In the United States today, hunger impacts more than 42 million Americans. This is a national disgrace caused by poverty and income inequality. In the not-too-distant future, hunger could also be the result of climate change. The warming climate is causing a host of alarming changes—unseasonable temperatures, disruptions in pollination, biblical floods and epic droughts —all of which threaten the long-term viability of our food supply. Yet despite these well-established risks to agriculture, the president has signed an Executive Order rolling back progress in the fight against the climate crisis. Extreme weather events harm crops and reduce yields, and they are becoming more frequent and intense all the time. We’ve seen this across the country and with many different crops, from cherries in spring (Michigan’s unduly warm winter in 2012 resulted in $220 million of losses) to pumpkins in the fall (in 2011 Hurricane Irene caused a pumpkin shortage in the Northeast) to staple crops year-round. Without serious reductions in greenhouse gases, by 2100 half the country’s corn harvest could be wiped out, wheat production could fall by 20 percent, soybean production by 40 percent. A decline in the nutritional value of crops is another consequence of a warming climate. Soaring levels of CO2 lead to a reduction in both the mineral and protein content of crops, including trace minerals such as selenium, zinc, and iron that are essential to human health. Plants are stationary. When the going gets rough they can’t move to a more hospitable location. Climates are changing faster than plants can adapt; as a result, one out of every five plant species is at risk of extinction. And food isn’t the only thing we rely on plants for—about half the drugs prescribed in the U.S. are plant-based. The solution? Rebuilding our nation’s soil health. We can begin by transitioning immediately to farming and ranching practices that respect soil as the living carbon-rich ecosystem that it is, rather than as merely a growing medium. These practices are regenerative, agro-ecological and organic, and include minimal tillage, cover cropping and increasing crop diversity to support soil microorganisms and beneficial insects. They create more resilient systems for farmers and free agricultural production from dependency on fossil fuels. 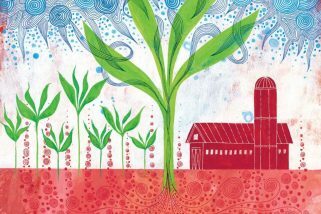 Most important, regenerative agriculture has vast untapped potential to rebalance Earth’s woozy climate system by drawing down excess carbon dioxide (CO2) from the atmosphere and storing it in the ground as life-giving soil carbon. As individuals, we can play an important role in building food security and resilience in our communities. So while Trump is busy ripping up the Clean Power Plan for the short-term benefit of a few corporations, engage however you can. Rip up the lawn. Plant some fruit trees. Start composting. Volunteer at a community garden. Create a garden school. Grow your own food-secure community. Start locally, and affect change nationally by putting pressure on elected officials. Now more than ever, we have to work urgently at the state, local, and community levels to implement policies that protect and support our food supply. A number of states (including California, Hawaii, Vermont, Maryland and New York) are planning ahead by focusing on regenerating degraded landscapes and incentivizing carbon-farming methods that increase soil health, reduce greenhouse gas emissions, and improve resilience to a changing climate. On the ground action is the way to achieve food security for everyone.